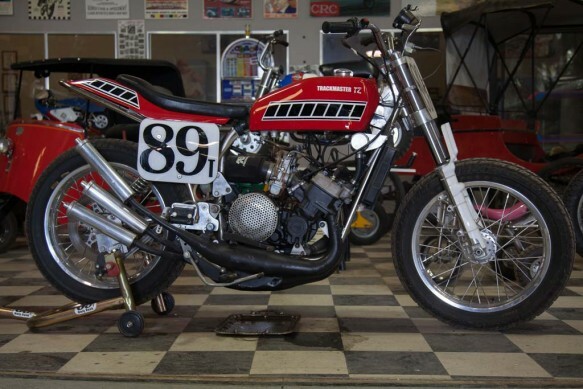 A TZ 750 Trackmaster, a four-cylinder 750 cc 2-stroke Yamaha in a Trackmaster frame. The TZ 750 was outlawed by the AMA after Kenny Roberts famously said, “Yamaha doesn’t pay me enough money to ride this.” Note the silver plated serving dish used to catch oil drips. TZ 750 Trackmaster (a 4-cyl 750 cc 2-stroke Yamaha in a Trackmaster frame. The TZ 750 was outlawed by the AMA after Kenny Roberts famously said, “Yamaha doesn’t pay me enough money to ride this.” Note the silver plated serving dish used to catch oil drips.